Well, today the degree of clutter-ness just went over the top. Nothing in particular tipped the balance but the overall visual chaos simply became too much for my poor eyeballs to tolerate. As I began to diminish the size of the piles (that's my typical method of organization: Organized Piles of Chaos), I also set aside those items that, although they are *just as darling and functional* as when I first obtained them, I now face the fact that I am simply NEVER EVER EVER going to use them. Or use them again, in the case of craft patterns. Therefore, over the next several posts, I am going to be presenting a bunch of items that I am offering for sale. All items are still in useful condition. If any item (such as a pattern) was used, I will tell you. 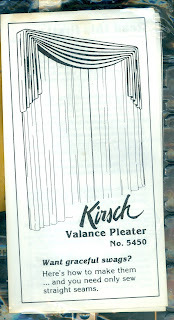 This post is for (4) packages of Valance Pleaters #5450 by Kirsch. Anyone who has done home decoration will recognize the Kirsch name. 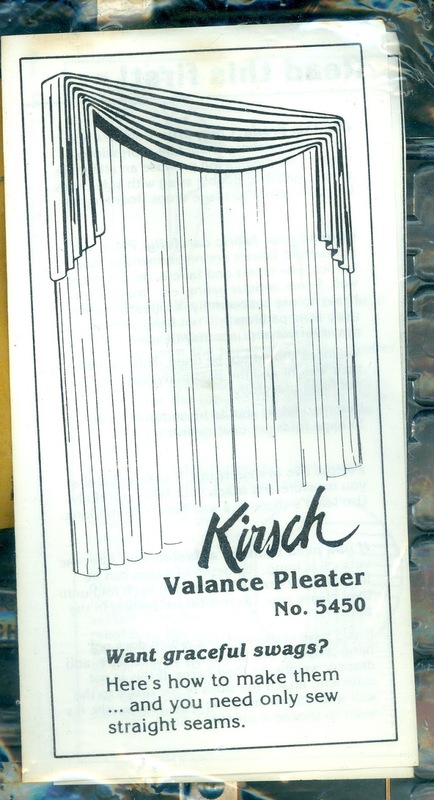 The "pleater" isn't a device like a smocking pleating machine but instead is a flat, heavy-duty plastic bar with slots in it that create the "pleats" of the valance when the fabric is slipped into the slots. 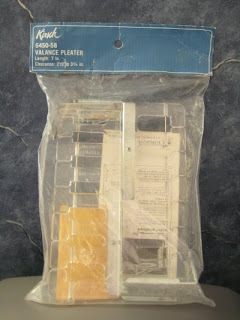 Each package contains 2 pleaters, one for each side of a window, so that each package will make a valance for ONE window. To be real obvious about it, all these packages together will make valances for *4* windows. None of the packages have been opened. The plastic bags look a little banged up but are intact. It *appears* that there is no limit to the width of the window; I assume you simply cut the appropriate length of yardage to go across the window plus the amount of the drop that you want. This is the back of the blue label in the above photo. It shows the kind of valance you can make. This is the front of the little pamphlet inside the package. I don't know exactly what is in the interior, since I've never opened the packages. At the very least, I assume it's directions on how to use them. A PDF that explains how the pleaters are used can be downloaded here; it very well could be the same information that is in the inside of the pamphlet. Don't those valances look pretty? Even better, there's no special sewing that needs to be done; the directions say only straight seams are required. I'm asking $7/package .. that's $28 total *plus* postage. My zip code is 94597. The weight of all 4 packages is 1 lb, 14 oz .. but you gotta include the weight of the box, so figure on 2 lbs. According to the US Post Office, standard post would be $9.79; a medium flat rate box would be $12.35. If you come up with a less expensive mailing option, I'm all ears. This is good only for the US ... shipping abroad is just way too expensive. Interested in sprucing up your windows? I'm sure you'll have better success than I did! :-) Contact me at pirate AT value DOT net to discuss your purchase. 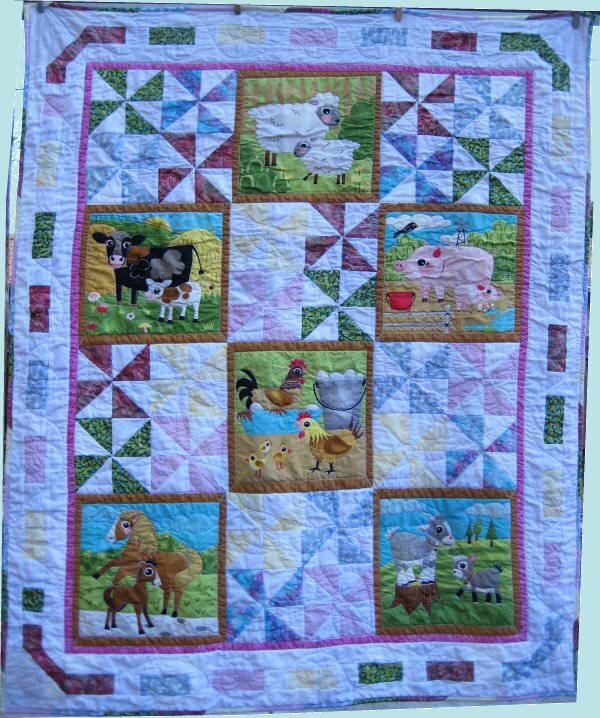 OInk-a-Doodle-Moo quilt is done and delivered! But not without considerable DRAMA during the construction process. And it was all because *arithmetic* doesn't work correctly. I'm sure that was the cause. In any case, the quilt was finished and even gift-wrapped BEFORE the baby shower .... usually I'm doing some last minute sewing of the binding in the car en route. The expectant Mom seemed to be pleased with the home-made quilt. 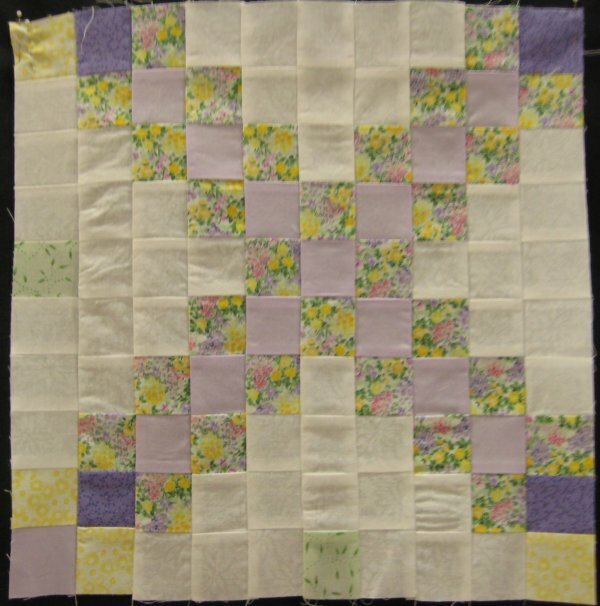 She even mentioned the baby quilt that I had made for *her*, 20 years ago. I was extraordinarily pleased that her quilt had been saved all these years. 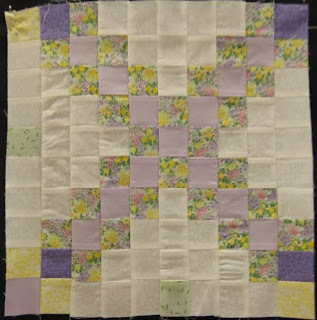 In fact, when I was looking at her quilt, I could see that it had been *used* during her growing up years because there was definite wear showing ... like some seams had come undone. Honestly, I wanted to fix them right there at the baby shower! But, back to the new baby quilt ... I've written about the trials and tribulations and shenanigans that occurred whilst I was making this quilt. It seems only right that I disclose all the dirty laundry (so to speak) so that y'all don't have the impression that all quilts come together magically. That picture is just a teaser! 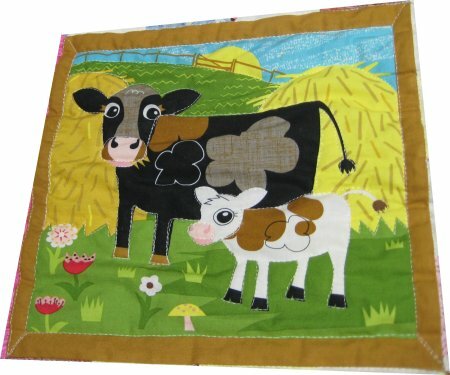 For all the gory details, links and more pictures, please visit my web page for the Oink-a-Doodle-Moo quilt. Now, of course, I can't use Moda's measurements because my quilt has different dimensions than their sample. But, look at how simple it is! My math isn't all that bad and I've been known to figure out some pretty complicated layouts. Sadly, this was not one of those times. I carefully measured the blocks of my center medallion (the printed block prints and the 4-patch pinwheels). I figured on a narrow inner border surrounding it. I totalled up the bottom line figure (in inches) of the white background fabric. I then measured my actual fabric. All the arithmetic seemed to be in order, so I started cutting the fabric. Remember that I have LIMITED amount of the white fabric. It's a large-ish piece leftover from some other project; it's not even yardage. I made the border blocks (as shown above) for the top border. In order to be more efficient, I also cut the white fabric for the bottom border (since it's the same as the top). Imagine my shock and dismay when I discovered that the blocks for the top border came out TOO SHORT for the center medallion. ?!?!??!?! Holy moley, how the heck did that happen?? And even worse, I've replicated the problem for the bottom border because I've already cut out those pieces. I can't just toss those pre-cut pieces because .... I have a LIMITED amount of the white fabric. Ay carumba. Well, I came up with a Frankenstein solution and it mostly looks OK.
On to the side borders. And dagnabit ... one of them came out "not exactly correct" either. This is very annoying. Remember .. I have a limited amount of the white fabric. But, pressing onwards, because I really do want to get this top completed tonight so I can start quilting tomorrow. I re-calculated the side border pices and cut them out. Uh oh. Something is seriously wrong. Remember that I had a LIMITED amount of the white fabric? Well, that "limited amount" has now become ... none. As in, I've run out of the white fabric. I still have 2 border blocks to make and 2 corner stones. See that bloody mark on the wall?? That's where I've been hitting my head. Well, my Mama didn't raise no quitter, so I Frankensteined another solution for the 2 border blocks but there was NO magic solution for the 2 corner stones. What I eventually ended up doing was using a plain white fabric for those 2 cornerstones. Luckily, if you squint just right and have less than adequate lighting conditions, I don't think you'll notice that 2 of the cornerstones are a completely different white fabric than the rest of the quilt. ::sigh:: It was the best I could do, seeing as this quilt needs to be completely finished and gift-wrapped in 4 days. On to the quilting .. which THANK GOODNESS .. was completed without any complications at all!! All the seamlines were stitched in the ditch. The next step to be done is to square up the quilt, make the label, bind the quilt and the final step ... launder it. I've started on the piecing for the Trip to Ireland barter quilt (I'm piecing a top for a quilting buddy; she's hand-quilting a quilt for me). This project is a combination of an Irish Chain block and a Trip Around the World block. This is the Irish Chain block. I need to make a messload of them. All of the strip sets have been sewn and I'm in the process of sub-cutting slices to make the Irish Chain blocks. I could be extremely efficient and sub-cut ALL the strips and bundle them together so that all I would have do to is sew-sew-sew. However, I've chosen to take cautious approach .. seeing as this is not my fabric, what I have is what I have and additional fabric is not available ... and I am sub-cutting the slices as I need them. You know what is really, *really*, REALLY annoying? Running out of bobbin thread when matching up intersections on the 10 segment Irish Chain. Harumph. If you must know, I was at the second segment but didn't realize it until the very end of the strip. Since there is no hard deadline for the Trip to Ireland quilt AND I have a high-priority baby quilt to make, construction of the Trip to Ireland blocks has been temporarily suspended until the end of the week. One of Mr. Pirate's nieces is expecting and a baby shower is this coming weekend. I had a baby quilt pattern all picked out. I was about to pull the fabrics for it when I came across the cutest name in one of the quilting blogs I read. Yep .. the name of the fabric line caught my fancy so I tracked it down. The line is "Oink-a-Doodle-Moo". Now honestly, how could you possibly resist such a name? Even better than having a complete fabric line to choose from, there is also a panel print of 6 barnyard blocks. 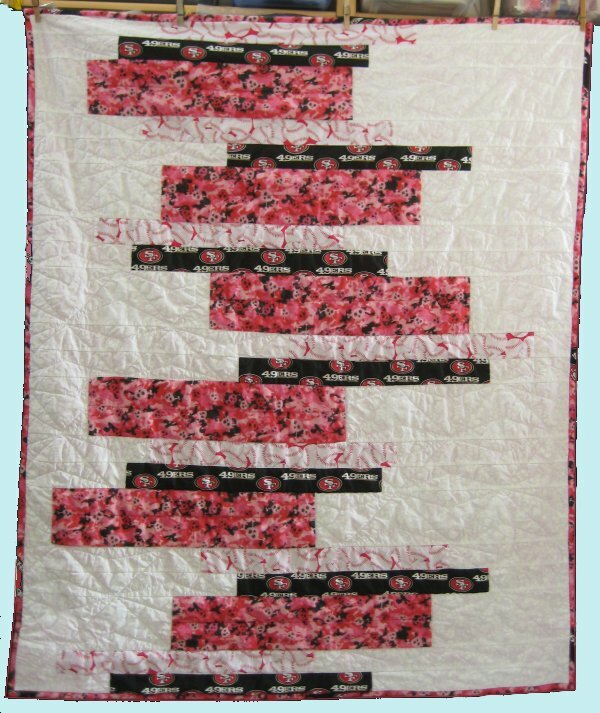 Now, as much as I disdain "cheater" quilts, this one is too cute to pass up! 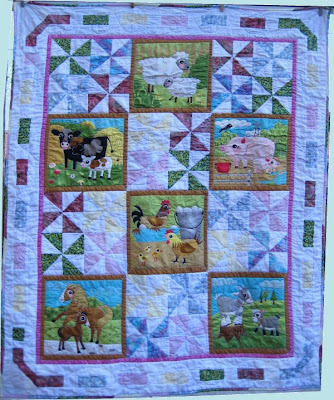 Using the quilt shown in Lovin' Life at the End of the Dirt Road blog post as an inspiration on use of the panel print, I am alternating 4-patch of pinwheels and the panel blocks. I'm undecided on whether or not to use her border. It's really, really cute but might be a tad more involved than I have time for. After all, not only do I need to construct the top but get it quilted and bound by *this weekend* ... 6 days away. I'll be thinking about what kind of border to put on it whilst I make all those pinwheel blocks. As you can see from this in-progress picture, I still have a few pinwheels to make. The black isn't part of the quilt; that's a sheet I'm using as a design wall. I can now finally do a proper show-n-tell on the 2 sibling quilts I've been working on and had mentioned in my previous post. Small about of background: I had made a baby quilt for one of Mr. Pirate's cousins. The new baby has 2 older siblings and I've finished lap quilts for the siblings. The boy's quilt was made from the Skinny Strips pattern. You can read all about the trials and tribulations of making this quilt, see lots of pictures and follow the links in Jacob's quilt webpage. 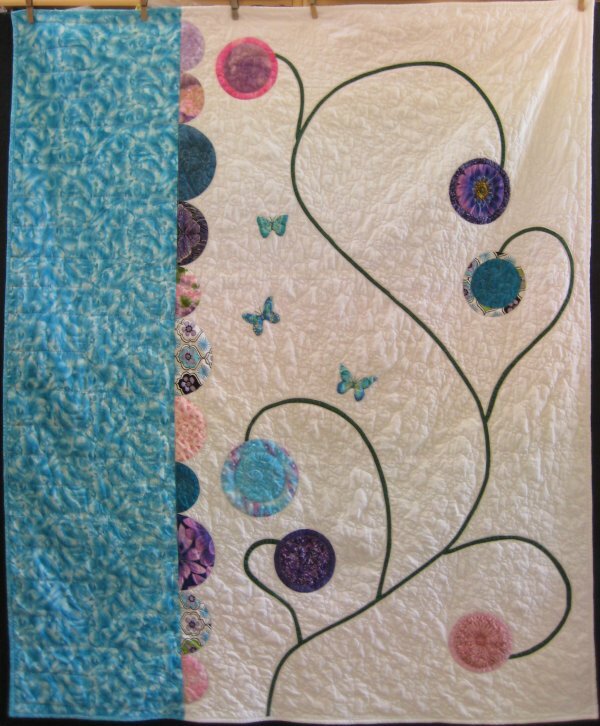 And the girl's quilt was made from an inspirational picture from a quilting blog I read. That blogger doesn't even know who designed the pattern because I asked. 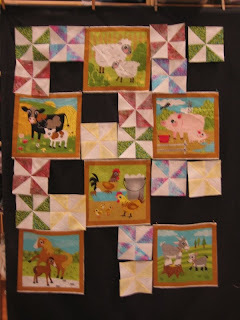 You can read all this quilt's adventures, see more pictures and follow the appropriate links in Jolene's quilt webapge. Now that those quilts have been delivered, the next thing for me to do is to take stock of where I am and just what project needs to worked on next. I know I need to work on a barter top (I'm piecing the top for her; she's *hand quilting* for me. I'm definitely getting the better end of this deal, but don't tell her I said so!). I have a computer-inspired quilt to make for my nephew. I have a fuzzy Minkee-like quilt to make for my favorite youngest daughter.